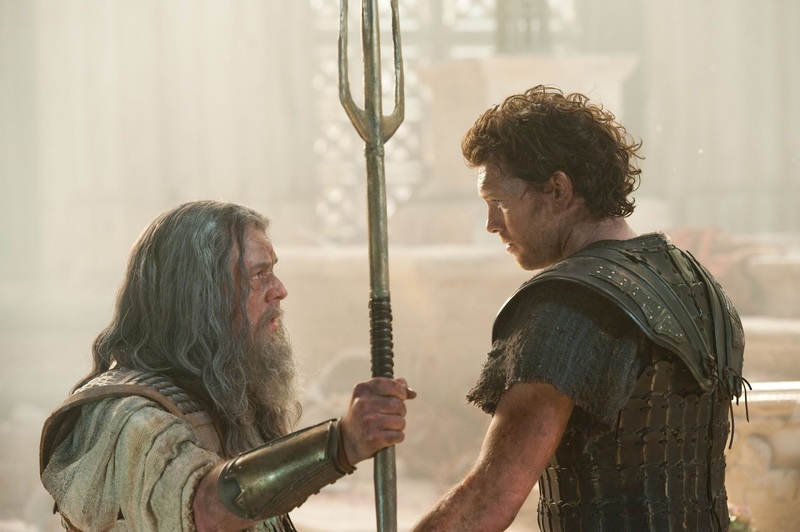 Two years ago, I was actually looking forward to the remake of “Clash of the Titans.” I had seen the 1981 original in an English class, of all places, and found it to be a very fun mythological camp adventure. As imaginative and flawlessly executed as the Harryhausen stop-motion effects were, though, I couldn’t help but wonder what “Clash” would look like today if a filmmaker took full advantage of modern effects and really went to town illustrating the struggle between men and Gods. It could be a revelatory action epic, and I was hoping that Louis Leterrier’s remake would fulfill the project’s true potential. Instead, we got a soulless, lazy, studio-manufactured bore, one with paper-thin characters, bad writing, and a messy, convoluted narrative. And despite a mammoth budget and cutting edge technology, Leterrier didn’t craft a single set-piece as inspired or engaging as Harryhausen’s work. 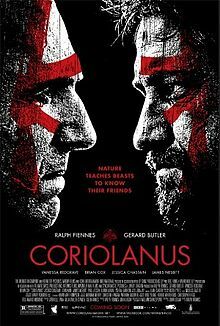 This review was originally published on November 11th, 2011 as part of my Starz Denver Film Festival coverage, and the film was later listed as the 15th best film of the year on my Top Twenty Films of 2011. The review is reprinted here to mark the film's Denver release at the Landmark Esquire. I obviously recommend the film quite highly. I have a feeling that “We Need to Talk About Kevin” is going to resonate very powerfully with audiences in and around Denver, particularly those who lived here during the Columbine High School massacre of 1999. I was six at the time, but I remember it clearly; it was the same week my Grandfather died, and his passing was only one small part of the larger, inescapable sense of communal grief enveloping Colorado. The anguish of the killings has never really abated, influencing so many corners of our local society. I’ve grown up in a reactive school system, one oppressively sensitive to anything that directly or, more often, indirectly echoes Columbine, where every conversation we had about teenage violence or misbehavior inevitably worked its way back to April 20, 1999. For adults, Columbine has come to represent the unbridled fear of losing a child at a place that should be safe; for kids, Columbine forever altered the way we are educated and treated. It all comes from a place of immeasurable grief brought on by an act of unspeakable evil, an event I’ve been close to for twelve years and still can’t come close to comprehending. 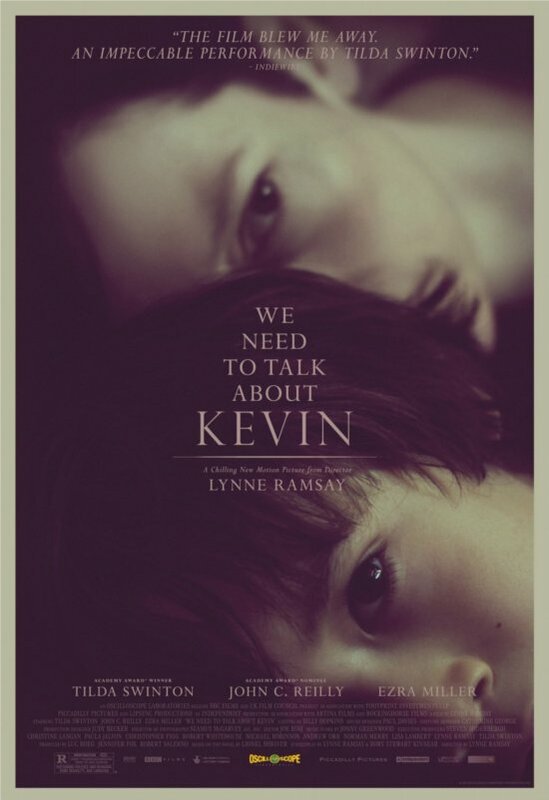 “We Need to Talk About Kevin” explores the epicenter of a Columbine-esque tragedy: the parent. Trust me when I say that no conversation about Eric Harris and Dylan Klebold ever goes by without mention of their parents, questioning how anyone could be so unaware of their child’s nature. 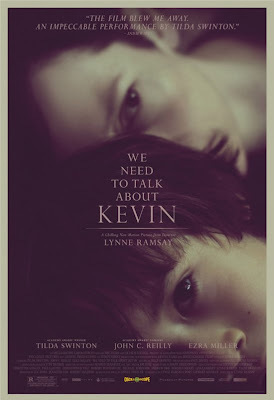 This is the enigma “Kevin” tackles, and it does so spectacularly, planting the viewer firmly into the mind of a killer’s mother and keeping us there for two straight hours. It is a relentlessly dark and uncomfortable experience, but also a profoundly rewarding one. The mother is never absolved, but we gain a keen understanding and sympathy. How could we not? The key question the film asks is one that should strike fear into the hearts of all viewers: what would you do if you didn’t love you child, if you hated them on instinct and they hated you right back? This review was originally published on November 10th, 2011 as part of my Starz Denver Film Festival coverage, and is reprinted here to mark the film's Denver release at the Landmark Chez Artiste theatre on Colorado Blvd. "Mad Men" Season Premiere Review - "A Little Kiss" - "What's wrong with you people?" 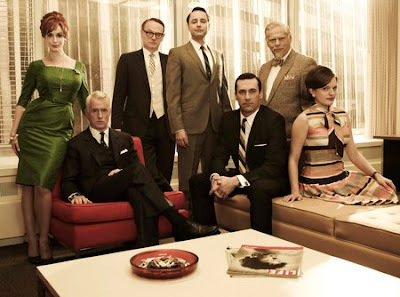 Mad Men, my second-favorite TV show of all time (The Wire being number one) is finally back after seventeen months off the air, and I’ll be reviewing and analyzing every episode of the fifth season as it airs. Tonight, we’re taking an in-depth look at the two-hour premiere episode, “A Little Kiss.” This review contains heavy spoilers, so don’t read unless you’ve seen the episode. Spoilers for “A Little Kiss” after the jump…. You know what I love about fishing? Subtlety. It is a quiet sport, one based on patience and discipline; it requires both a nuance of craft and a stillness of mind, which is precisely why fishing is such an attractive activity to many. With a rod in one’s hand, in a boat or in waders, where else can one find such mental peace and clarity? I’ve been waiting for this day for a long, long time. “Battle Royale” – the controversial Japanese masterpiece from the year 2000 – has finally been released on home video in the United States, twelve years after its original overseas release, in a four-disc Blu-Ray package assembling two cuts of the original movies, one cut of the inferior sequel, and an entire disc of Bonus Material. It’s a very exciting compilation, and as such, I’ve gone all-out for this Blu-Ray review, giving you my in-depth analysis of both films, technical critiques of the video and audio quality, a look inside the packaging, and an overview of all the extras. Whether you’re a fan of the films or are new to the franchise this is a review you won’t want to miss. 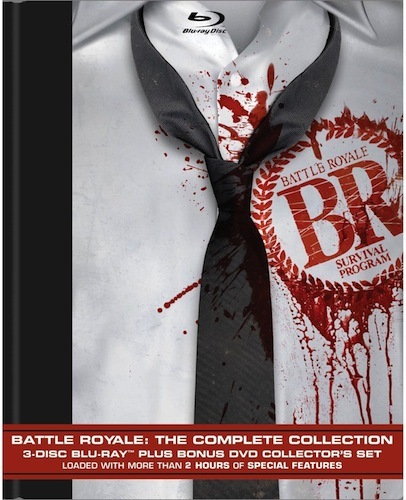 Read my Blu-Ray review of “Battle Royale: The Complete Collection,” after the jump…. 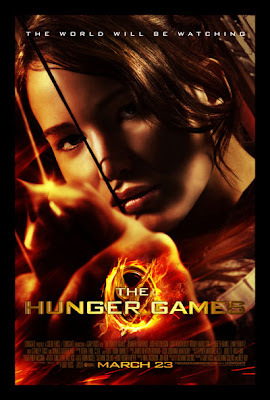 Tomorrow, the first big tent-pole release of 2012 hits theatres: “The Hunger Games,” an adaptation of Suzanne Collins’ 2008 smash-hit novel. I’m excited for the movie, as are many others, but here’s the thing….when I read the book, it felt awfully familiar. In fact, it was remarkably similar to one of my favorite books of all time, Koushun Takami’s “Battle Royale,” published in 1999. So throughout this week, I’ve been publishing a special three-part article investigating whether or not Collins stole from Takami, and why that informs how we should look at “The Hunger Games.” In Act Three, the final part, I provide my ultimate conclusions on all the issues I’ve been writing about all week. If you haven’t read Acts One or Two yet, they went up yesterday; my review of “The Hunger Games” movie will be published tomorrow. 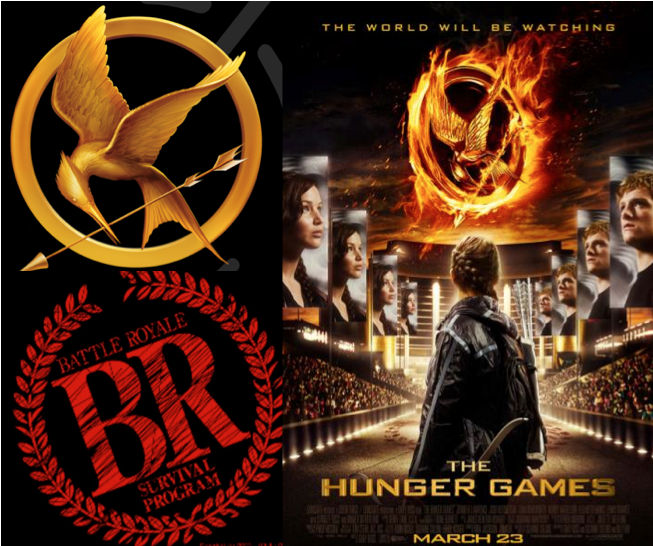 So without further ado, enjoy Act Three of “The Hunger Games” Vs. “Battle Royale” after the jump…. 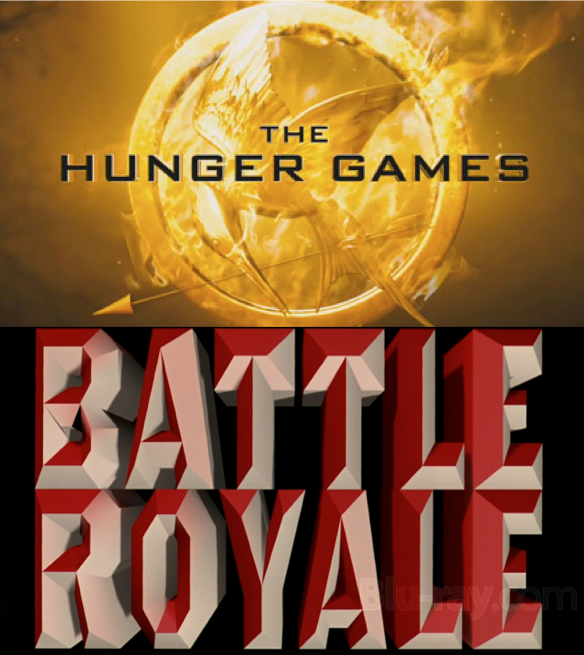 Today, we’re focusing on what I consider to be an important cultural question: if “Battle Royale” and “Hunger Games” are indeed so similar, then why is one so wildly controversial and the other widely accepted? 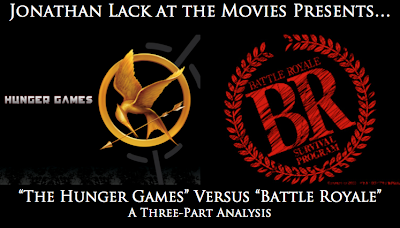 My answer: “The Hunger Games” is the Dumb American Version of “Battle Royale.” Before you stone me, let me explain myself in Act Two of the article; Act One went up yesterday, and Act Three will post tomorrow, followed by my review of the “Hunger Games” film on Friday. This Friday, the first big tent-pole release of 2012 hits theatres: “The Hunger Games,” an adaptation of Suzanne Collins’ 2008 smash-hit novel. I’m excited for the movie, as are many others, but here’s the thing….when I read the book, it felt awfully familiar. In fact, it was remarkably similar to one of my favorite books of all time, Koushun Takami’s “Battle Royale,” published in 1999. So throughout this week, I’m publishing a special three-part article investigating whether or not Collins stole from Takami, and why that informs how we should look at “The Hunger Games.” You’re reading Act One, wherein I explain all the similarities between the two novels. Acts Two and Three will go up over the next two days – the Prologue, which explains this whole scenario, was posted yesterday. 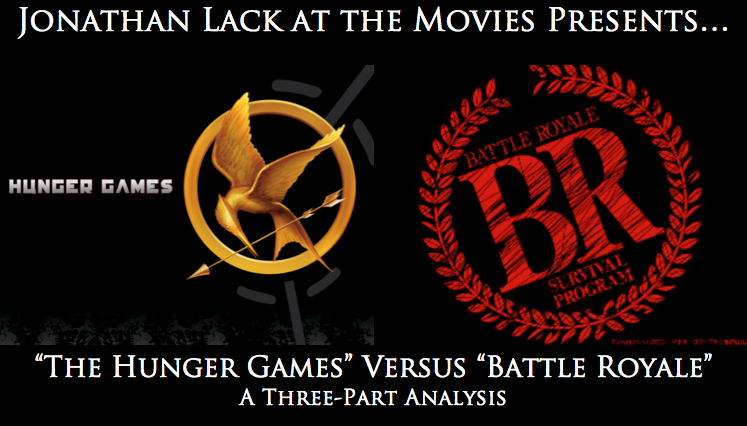 So without further ado, enjoy Act One of “The Hunger Games” Vs. “Battle Royale” after the jump…. Announcement: “The Hunger Games” Versus “Battle Royale” – A Critical Analysis of Two Similar Works – A Special 3-Part Feature coming this week! Late last year, I decided to read Suzanne Collins’ “The Hunger Games.” I’d been hearing massive amounts of positive hype about the book for years, and with a major motion picture on the horizon, I knew I’d have to experience the story sooner or later. Despite all the publicity, I really didn’t know a single thing about the story, except that, since Jennifer Lawrence had been cast in the film adaptation, the main character was a girl. I like going into stories cold, and that’s such a rare opportunity these days that I thought it would be best to read “The Hunger Games” before movie trailers started arriving and ruining everything. So with lots of time to kill on a road trip from Colorado to Iowa, I bought the novel on my Nook and started reading, eager to see what all the hype was about. A little while later, I was confused. “The Hunger Games” wasn’t new to me at all. I already read this book. In fact, I read it a long time ago, years before “Hunger Games” was even published. Back then, it was an English translation of a Japanese novel called “Battle Royale,” written by author Koushun Takami, but there was no mistaking it: I had already read this book. But let’s back up a moment for those unfamiliar with these two novels. “The Hunger Games” is about a dystopian future where the tyrannical government demonstrates its control over the people by hosting an annual event, the titular Hunger Games, where 24 children, aged twelve to eighteen, are randomly selected from across twelve districts to compete in a battle to the death, where participants must kill one another until only one adolescent survives. “Battle Royale” is about a dystopian, alternate-history Japan where the tyrannical government demonstrates its control over the people by randomly selecting a class of 42 high school students, aged fifteen, to compete in a battle to the death, where participants must kill one another until only one adolescent survives. The core difference between the two stories is that “Battle Royale” was published in 1999 while “The Hunger Games” was published in 2008. 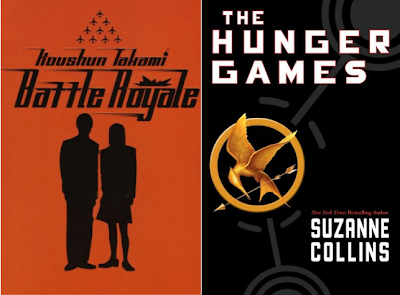 After discovering the premise to “The Hunger Games,” I posted my concerns on Facebook, where I was immediately flamed by fans of the novel for being unfair, despite the fact that none of them had ever before heard of “Battle Royale.” But I was enjoying “Hunger Games,” and gladly finished the novel. It was fun. A really engaging page-turner. But try as I might to ignore all the parallels to “Battle Royale” I had discovered, I couldn’t shake the feeling that this was a watered down version of a superior novel. Hence the following Facebook message: “‘The Hunger Games’ is the dumb American version of ‘Battle Royale.’” More outrage, this time even more heated. Hmm. Perhaps Facebook was not the proper forum to report my findings, and I vowed to explain my argument in my own particular idiom. Sounds like fun, right? I think you’ll be reading some of my very best writing over the next four days, and I’m very excited to share it with you…. “Jeff, Who Lives at Home” is a wonderful little film about people escaping a rut of melancholy. It is subtle, honest, and personal, built around real human emotions uncomplicated by manufactured sentiment or a convoluted narrative. Every Wednesday this spring, I'm reviewing and analyzing the short-lived TV classic from 1999, Freaks and Geeks. Today we reach Episode 10, "The Diary," an episode that is simultaneously jubilant and painful - and, of course, brilliant. (And like all my TV reviews, I expect the reader has seen the episode in question, so if you haven’t, go track down the DVDs and return here when you’ve caught up. The review will be waiting patiently for you.) And just so nobody gets surprised next Wednesday, there isn't going to be a "Freaks and Geeks" review next week, since I'm publishing a week-long Special Feature article about "The Hunger Games" (which comes out in movie form next Friday) during that time. 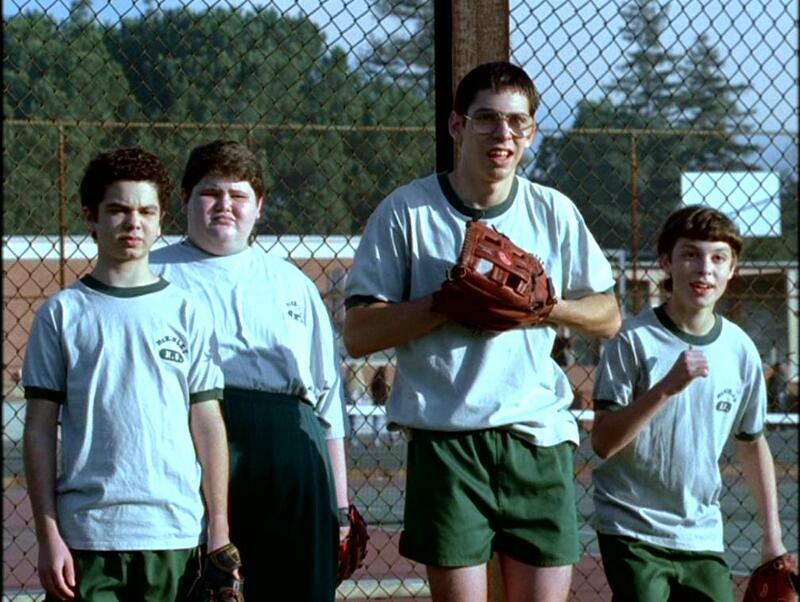 Regular "Freaks and Geeks" reviews will resume on March 28th. The "Monthly Stuff" Podcast #4 - Xbox "720" Rumors, Discussion, and more!! It’s time for another installment of The “Monthly Stuff” Podcast, where yours truly, Jonathan Lack, and Sean Chapman talk about…well, stuff. 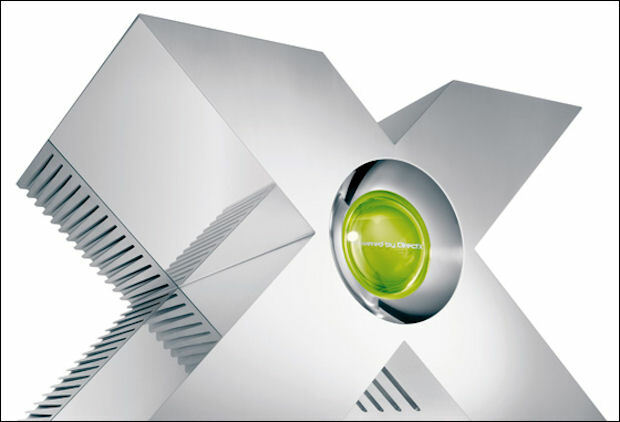 This month, we cover a topic that should be of interest to our fellow gamers – the mythical Xbox 720. There have been lots of rumors floating around, from release dates to hardware reports and more. In our topic segment, we discuss all the major rumors, trace the history of the Xbox 360, and explain why we may not even want a new Xbox in the near future. In addition, Sean gives us his analysis of the latest Xbox smash hit, “Mass Effect 3,” and we do another “Monthly Round-Up” discussing recent movie news we feel may be of interest to our listeners. Click here to stream the podcast in your web browser!! Click here to subscribe to the “Monthly Stuff” podcast in iTunes for FREE!! Sorry for the delay....What's happening at JonathanLack.Com? 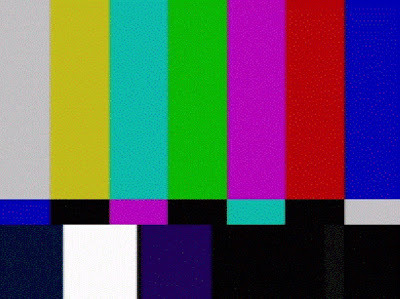 You may have noticed a rather obvious lack of content on this website over the last few days. 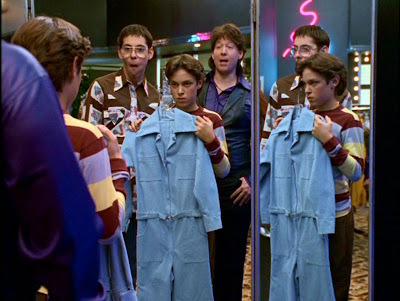 My last new post was the most recent “Freaks and Geeks” analysis from Wednesday, and I pushed my “John Carter” review to the top of the page to create an illusion of fresh material. So for the first weekend in a long, long time, I had no new movie reviews for your reading pleasure. Sorry about that. Hopefully it won’t happen again any time soon. 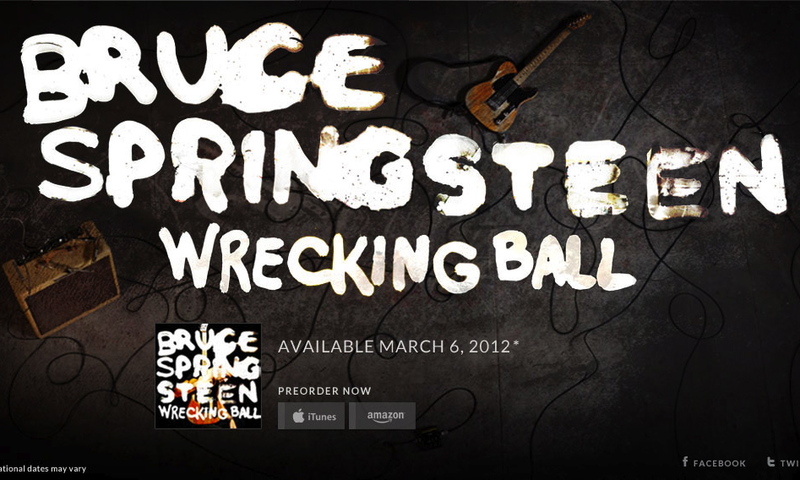 As you may have noticed from the hit count on the right hand side of the screen, this website has taken a huge uptick in traffic over the last few weeks, primarily due to my series of Bruce Springsteen "Wrecking Ball" articles. We got an awful lot of new readers because of that (hi everybody!) – three or four times as many daily hits as before on average – and the “John Carter” review quickly became the most-read movie review on the site as well. So I’ve spent the last few days reevaluating what to do with the site and planning for the future; now that I’m semi-popular, I feel I have a responsibility to deliver more content than I have in the past. My goal is to eventually have daily posts, but that’s obviously too much for one guy (who has another life and set of responsibilities away from all this) to accomplish, so I’ve also been in contact with some of my writer friends to see if they would like to contribute content as well. Thankfully, Sean Chapman, who co-hosts the “Monthly Stuff” podcast with me, has agreed to write for the site, and you should start seeing articles from him shortly, articles I highly recommend reading. He’s a phenomenal writer. As for me, I’ve got lots of great content coming in the weeks ahead. 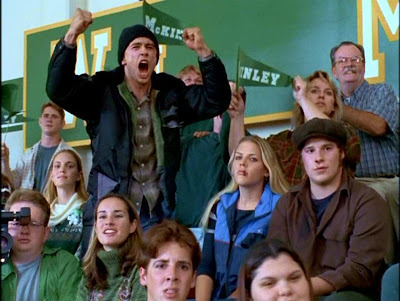 A really great new “Monthly Stuff” podcast will be hitting the site tomorrow, and your regular “Freaks and Geeks” review will arrive on Wednesday as per usual. And to celebrate the release of “The Hunger Games” movie, we will have four straight days of Hunger Games-related articles starting one week from today, articles my readers will definitely want to check out. There will also be a new weekly column – Springsteen Sundays – beginning this Sunday; since my Wrecking Ball coverage proved to be so wildly popular, I thought I’d put my Springsteen fan knowledge to good use by dishing out some weekly musings on the works of the Boss. And beyond all that, there’s plenty of other good stuff in the works. If all goes well, there should be other weekly columns coming your way soon enough. 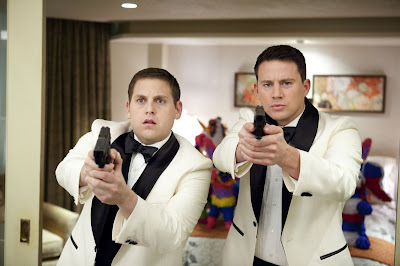 All this is in addition to the regular movie reviews that come out every weekend, and starting Friday, I’m planning on writing about “Jeff Who Lives at Home,” “21 Jump Street,” and possibly more. There’s lots of exciting stuff happening here at www.jonathanlack.com, so be sure to visit often! I wanted to like John Carter. I really did. I never read the Edgar Rice Burroughs novels growing up, but I’m well aware of the passion they’ve stirred in others, and I’m a huge fan of the many sci-fi and fantasy works they helped inspire, such as “Star Wars.” With Andrew Stanton – one of co-founders of Pixar and director of “Finding Nemo” and “WALL-E” – at the helm, I was actually kind of excited to see the film, despite a marketing campaign so wretched it seemed like Disney was actively embarrassed by the end product. 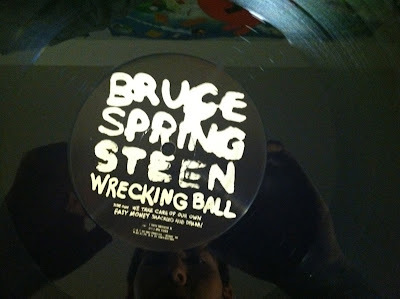 Unboxing the Vinyl Edition of Bruce Springsteen's "Wrecking Ball" - "Let me hear your voices call" for this picture log! The label of the vinyl edition of "Wrecking Ball"
The album I've been writing about for weeks is finally here - literally! Wrecking Ball, the latest studio album from Bruce Springsteen, arrives in stores today in a variety of packages - Regular CD, Special Edition CD, Digital, etc - but if you're an audiophile like me, it's likely you've opted for the Vinyl edition of the record. My copy arrived from Amazon only a little while ago, and I documented the unboxing process - always an exciting moment - in pictures to share with other eager fans! I haven't listened to the Vinyl version yet - I'm sadly away from my turntable today - so a review of the Vinyl sound quality will have to wait. Until then, continue reading after the jump to see my picture log of the Unboxing!! 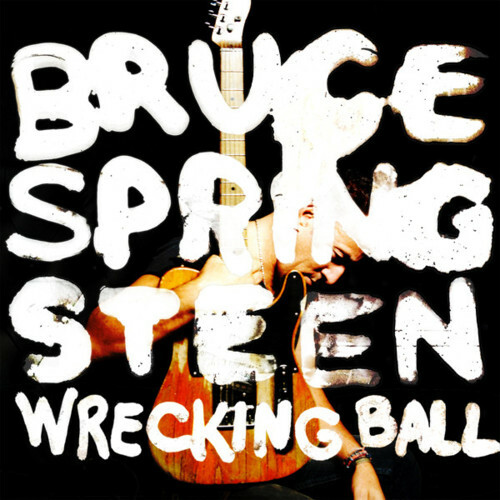 Analyzing Bruce Springsteen’s “Wrecking Ball” Bonus Tracks – Are “Swallowed Up” and “American Land” worth your time? Happy Wrecking Ball day everybody! Today marks the release of Bruce Springsteen’s seventeenth studio album – his first in over three years – and if you haven’t heard yet, I think it’s wonderful. In addition to my full review, I’ve performed an in-depth, track-by-track analysis of the entire album, and you’ll find links to those articles at the bottom of this post. Today I’m here to finish up the job. See, Wrecking Ball is available in two configurations: a regular edition – just the 11-track album, no frills, available on CD, Digital, and Vinyl – and a special edition with two Bonus Tracks, available on CD and Digital. Since I already analyzed every track of the main album, it’s only fair I give you my thoughts on these bonus tracks as well, “Swallowed Up (In the Belly of the Whale)” and “American Land.” How do they hold up next to the album proper? Are they worth the extra money it will take to purchase them? After forty years of recording, seventeen studio albums, and untold levels of fame and acclaim, Bruce Springsteen refuses to stop evolving. Musically, lyrically, and thematically, his latest record, Wrecking Ball, is unlike anything else in his discography, and that alone is cause for celebration. A new producer, Ron Aniello, has opened the Boss’s sonic pallet in exciting new directions, while Springsteen himself has composed a brilliant set of songs that see him examining the world in ways he never has before. Of course, many critics will fail to recognize this; on the surface, Wrecking Ball isn’t a huge thematic departure from prior works. I predict it will be widely interpreted as a portrait of American frustration and melancholy following the economic collapse, an angry tirade against the forces that robbed us dry and stole our freedoms, and like all Springsteen works, a meditation on the distance between the American Dream and the American Reality. 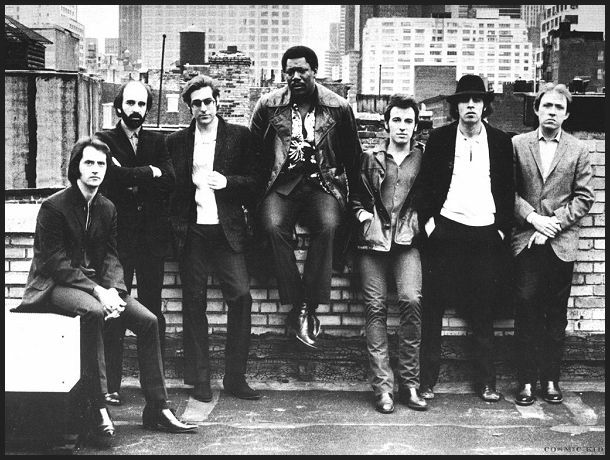 This interpretation is fair – in the album’s opening tracks alone, Springsteen hits at the heart of what Occupy Wall Street is about far more clearly than the Occupy protests ever have – but it’s also too narrow, and misses the real meat of Springsteen’s message.